Engines roared and Kyle Busch dominated, winning both Stage One and Stage Two, at the Auto Club 400 in Fontana, California last week. With Joey Logano and Brad Keselowski battling for first, Busch emerged and stole the lead. With his victory, Busch tied the great Richard Petty for most all-time wins with 200. Auto Club 400 brings screaming fans to their feet like no other track as cars stack up for the track’s signature racing style: "flat out and five wide" at 180 miles per hour. Even with the all the familiar excitement, there is some uncertainty this season, as NASCAR introduces a whole slew of new rules designed to increase interest in the sport. The entire package of rules is geared toward keeping tighter racing in order to keep fans on the edge of their seats. The aerodynamics of the cars is a focus. NASCAR is decreasing the horsepower of the cars from 750 to 550, while increasing downforce and drag. A lack of horsepower will slow down the cars, but the drag and downforce will make the cars easier to handle. These changes should cause more opportunity and ability to pass. By the numbers, the changes mean the spoiler must be 8 inches instead of 2.375 inches, the front splitter increases from 0.25 inches to 2 inches, and the radiator pan being widens to 37 inches. Hundreds of families were on hand for the race, ready to enjoy that better fan experience. Christian Kenney, 8 years old, and his sister Kaitlin Kenney, 11, attended with their dad and mom. “We’re big overall sports fans,” said their dad. 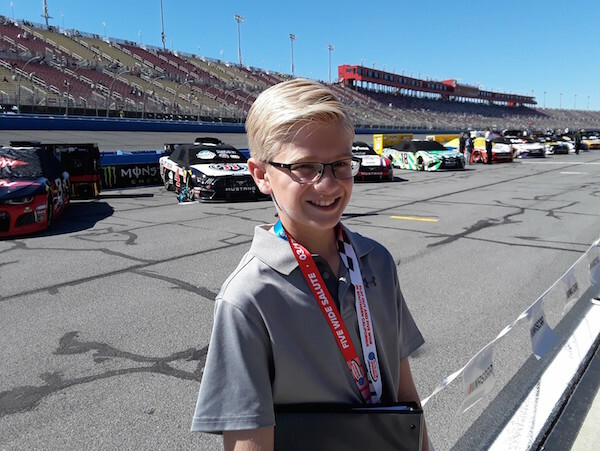 “We wanted to get the NASCAR flavor since it’s a good price for families to come enjoy a Sunday together.” Auto Club Speedway offers a free Lefty Kids Club membership with lots of free kid activities and reduced grandstand prices for children 12 and under. Busch was mentioned as a consistent favorite by many kids including Santiago Lopez, 10, who added, “This is my first race, and I’ve always wanted to go after watching races on TV.” Denny Hamlin and veteran Jimmie Johnson also were listed as top drivers amongst kids. All drivers had fans cheering them on enthusiastically as they passed the grandstands. From the moment Mötley Crüe announced “Start Your Engines” to Busch’s historic victory lap, fans were electrified at Auto Club 400. Engines revved and rubber flew as the drivers battled to win on the wide track. Rule changes or not, NASCAR was alive and well and ready to race in Southern California this weekend.